Jackie and Brody — Flute duet. Today we present a very nice piece for two flutes composed by one of our visitors, Spyros Kontolatis from Greece. 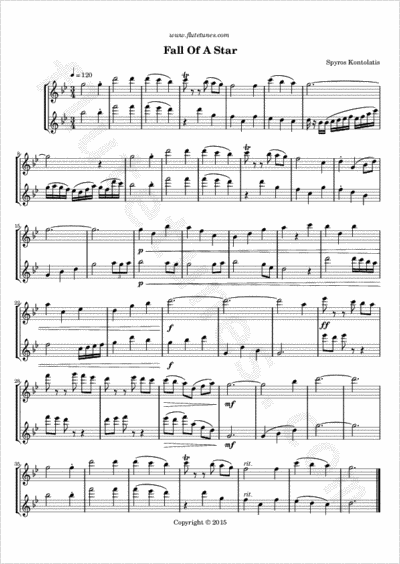 While practising the high octave, the main melody just came to me and I started humming it. After it was vaguely formed, I figured the exact scale for it on my guitar, because theory and harmony come easier to me there, and decided to write it as a flute duet in G minor. The main reason for the moderate tempo is that I wanted to focus on tone practice and to make transitions in the high octave easy. I added the second flute part so that the song would sound fuller harmonically, and so that I could use it to practise tuning with my teacher. I named the piece “Fall of a Star”, because that's what the melody reminded me of. Then I shared it with my teacher and some friends and, since they liked it, I decided to try to submit it to flutetunes.com, because I figured, if it helps me learn, why not help others too? Thank you for your contribution, Spyros!